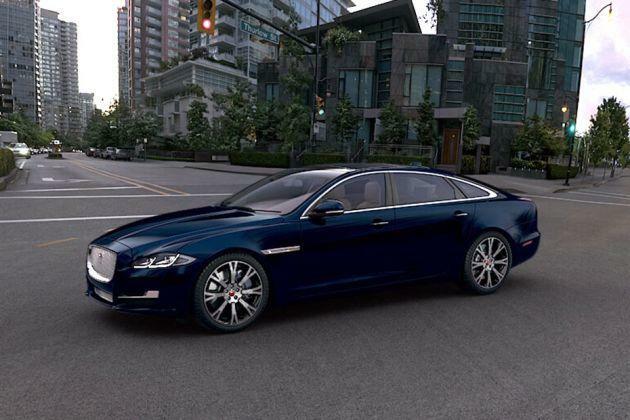 Jaguar XJ is a four seater luxury saloon that comes with only with a diesel engine option. At present, it is available in two variants among which, the Jaguar XJ 3.0L Premium Luxury is the entry level diesel variant. It is powered by a 3.0-litre, V6 turbocharged engine that is capable of producing 271.23bhp and yields a peak torque output of 600Nm. This motor is paired with an advanced 8-speed automatic transmission gearbox that helps in delivering an average mileage of 7.75 Kmpl. This trim is available with an option to customize the interior color scheme, leather grains, contrast stitching and its veneers. On the other hand, this trim comes equipped with advanced comfort features including rear parking aid with touch-screen visual indicator, four zone climate control system and a 380 Watt Meridian audio system. As far as the safety aspects are concerned, this trim comes incorporated with a pedestrian contact sensing system and a security system with engine immobilizer and alarm. This vehicle competes with the likes of BMW 7 Series, Mercedes Benz S Class and Audi A7 in the Indian automobile market. The external appearance is quite distinct down to the lowest detail. This vehicle has a large body structure, but it looks quite sleek owing to its signature cosmetics. To begin with its front profile, it has an aggressive-eye shaped headlight cluster that is equipped with xenon headlamps along with day time running lights and turn indicators. In the center, there is a large perforated radiator grille that is done up with a lot of chrome and is integrated with company's logo. The bonnet has four expressive lines that compliments the design of grille. The front bumper is in body color and is further equipped with a pair of air ducts and an air dam. Its side profile has a breathtaking body structure owing to its sleekly structured window frames. Its wheel arches have been equipped with a set of stylish Meru alloy wheels, which are further covered with tubeless radial tyres. Its B and C pillars are in glossy black finish, while the sill surround gets a chrome treatment. Its rear profile is perhaps the most stylish in its class, thanks to its distinct styled taillight cluster and expressive tailgate. The rear bumper has an urbane structure and is equipped with a diffuser along with a pair of chrome exhaust pipes. The taillight cluster is powered by all LED lamps including turn indicators and brake light. Its internal cabin is made using rich leather and scratch resistant materials that gives a luxuriant finish. There is plenty of leg and shoulder space available in the second row as it comes with large wheelbase of 3157mm. Its rear cabin is fitted with two individual seats that have upper back articulation including massage function as well. The seats in the cockpit are 20-way electrically adjustable that also includes 3-position memory setting . All these seats are further provided with heating, ventilation function and have been covered with soft-grain perforated leather upholstery. This trim has been equipped with an elegantly crafted dashboard with a dual tone color scheme that is further ornamented by chrome glossy black inserts. In addition to these, the door panels have been decorated with wood inserts that gives a captivating look to the interiors. It is further loaded with a storage box, a stylish central console, AC unit accessory power socket and an infotainment system. This vehicle is powered by an advanced 3.0-litre diesel engine that is incorporated with direct fuel injection system. It has a total of six cylinders and 24-valves that displaces 2993cc. This power plant is further incorporated with a turbo-charging unit that enables the motor to unleash a peak power of 271.23bhp at 4000rpm in combination with a mammoth torque output of 600Nm at just 2000rpm. This motor is mated with an advanced 8-speed automatic transmission gearbox including a Jaguar Drive Selector that transmits the torque output to all four wheels in AWD format. This vehicle can reach an electronically limited top speed of 250 Kmph and it can break a 100 Kmph speed mark in mere 6.4 seconds. On the other hand, this vehicle can produce a mileage in the range of 5.8 to 10.5 Kmpl. Both the front and rear wheels have been fitted with a set of internally vented brake discs, which are further loaded with advanced brake calipers. This proficient braking mechanism is further enhanced by anti lock braking system , emergency brake assist and electronic brake force distribution. In addition to these, it has electronic stability program and dynamic traction control, which helps to improve agility of this vehicle. On the other hand, this variant is bestowed with adaptive air suspension system on both front and rear axles that keeps the vehicle well balanced on any road condition. This Jaguar XJ 3.0L Premium Luxury trim is the entry level trim, but it gets some advanced comfort features like JaguarDrive Control, front and rear parking aid with visual alerts on infotainment screen and a cruise control system. This saloon is also fitted with a four zone automatic air conditioning system that has air filtration facility and humidity sensing along with air quality sensors and auto recirculation. Also, it is loaded with aspects like Jaguar smart key system with key less entry and key less start system, panoramic glass roof with electric blinds, front central console with storage compartment, electric rear side window sun blind and soft door close. In addition to these, it has aspects like illuminated rear vanity mirror, LED rear reading lights, new style rear business trays and a carpet mat set. It also includes an advanced JaguarSense for glove box opening and overhead light console operation. The car maker has incorporated this variant with a 380 Watt Meridian audio system including an 8-inch full color touchscreen display, navigation system, Bluetooth connectivity for audio and video streaming and rear seat entertainment with two 8-inch color displays. This luxury saloon comes with a reinforced protective bodyshell that is made of aluminum body panels, which can deal with the impact caused in case of a collision. This trim has safety aspects like airbags and whiplash protection, child seats, pedestrian contact sensing system and 3-flash lane changing indication. 1. Luxurious interiors with sophisticated comfort features. 2. Engine performance and acceleration is quite good. 1. Price range is quite expensive. 2. Fuel economy can be improved.